Spray 5-quart slow cooker with cooking spray. In shallow dish, mix flour, sage, salt and pepper. Add ribs; turn to coat with flour mixture. Place ribs in slow cooker. In 12-inch skillet, melt butter over medium-high heat. Cook onion in butter 5 minutes, stirring frequently, until tender. Spoon onion over pork. In medium bowl, stir together soup, gravy mix and broth; pour into slow cooker. Cover; cook on Low heat setting 7 hours. 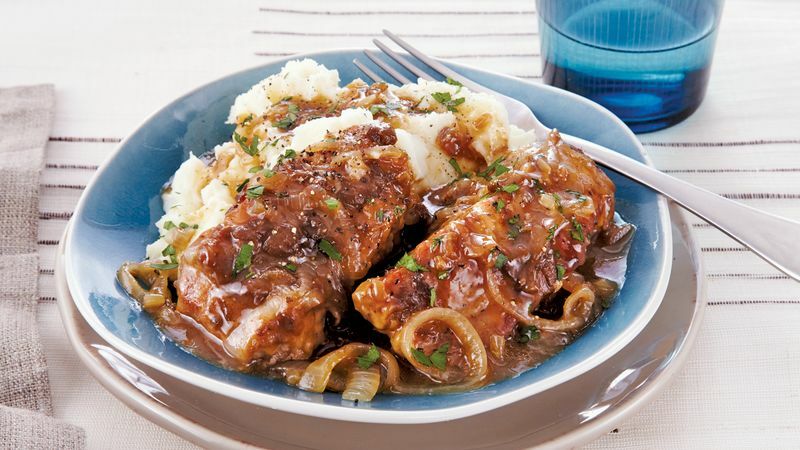 Serve pork, onions and gravy with mashed potatoes.